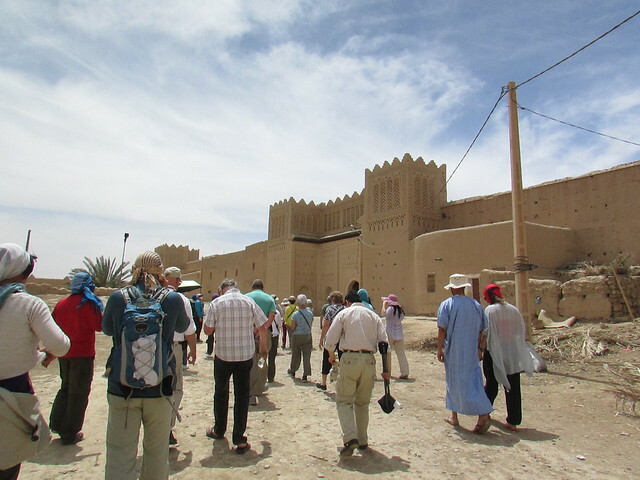 A tour group entering a ksar. Per wikipedia: Ksar, plural ksour (Maghrebi Arabic: قصر qser, plural qsur) is the North African Meghrebi Arabic term for "castle", possibly loaned from Latin castrum. The term generally means a fortified village. I like the long, blue flowing shirt, - and the castle is pretty nice, too. Almost looks like a giant sand castle. I bet it's amazing inside! Now I know what ksar means. It definitely looks like a fort from the outside. Impressive entrance, and a super K word.